PenDelfin Scout booklet that folds out to be a 12 page leaflet. 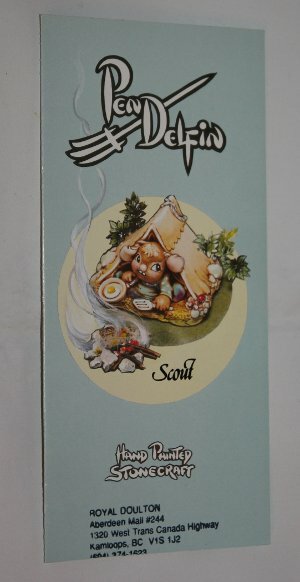 The PenDelfin Scout rabbit was designed by Doreen Noel Rabbits and introduced into the PenDelfin rabbit family in 1992. 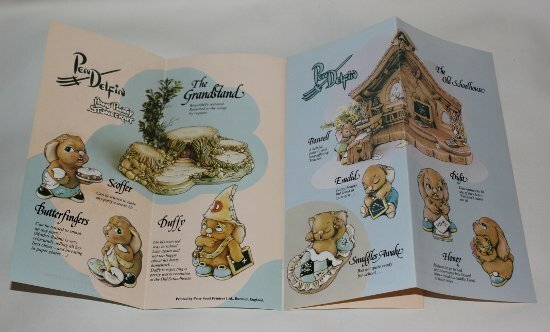 When opened up this PenDelfin booklet features many of the PenDelfin rabbits that were for sale at the time. It includes pictures of the PenDelfin Grandstand, the PenDelfin Old Schoolhouse with all the PenDelfin school rabbits, whilst on the back it pictures the old PenDelfin Block Mounted Pictures that were picture images from the PenDelfin story books and were a great addition to a collection allowing you to add artwork to you walls around your PenDelfin collection! Condition: Very good overall condition. It has a shop stamp on the front from a store in Kamloops, British Columbia, Canada!